Attacks against foreigners continued in the South African port city of Durban Tuesday as the Ethiopian community prepared to repatriate the bodies of three of its nationals killed over the last two weeks. Ephraim Meskele, a leader of the Ethiopian community in Durban, said it was holding a prayer service Tuesday for the three victims, including a man killed when his shop was petrol-bombed on Friday. About 50 people have been arrested over the violence, in which at least four people have been killed. The police have not confirmed the nationalities of the victims. 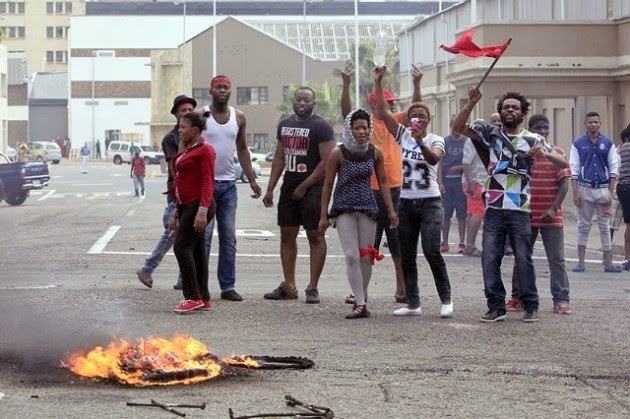 The attacks on immigrant-owned shops and homes in Durban’s impoverished townships come three months after a similar spate of attacks on foreign-owned shops in Soweto, near Johannesburg. Over 1,000 foreigners in Durban have fled their homes and are now living in makeshift camps, under police guard. Tensions were still running high on Tuesday, with local media reporting that about 2,000 armed migrants were engaged in a tense stand-off with police in the city centre, and looting continuing in townships on the outskirts of the city. Violence against African immigrants in South Africa is common, with impoverished locals accusing foreigners of taking their jobs and business. The latest outbreak comes after several high-profile figures — including a son of President Jacob Zuma — made polarising statements against foreigners. Last month, Zulu King Goodwill Zwelithini, traditional leader of the biggest ethnic group in KwaZulu-Natal province, reportedly said they needed to “pack their bags and leave”. It was a call supported by Edward Zuma, who told local news agency News24 that South Africa was “sitting on a ticking time bomb of them (foreigners) taking over the country”. The government has, however, condemned the violence, with several ministers speaking out on Tuesday.